LADY LUND: A little Midnight Snack. This is our way of celebrating the end of a busy Thanksgiving week. 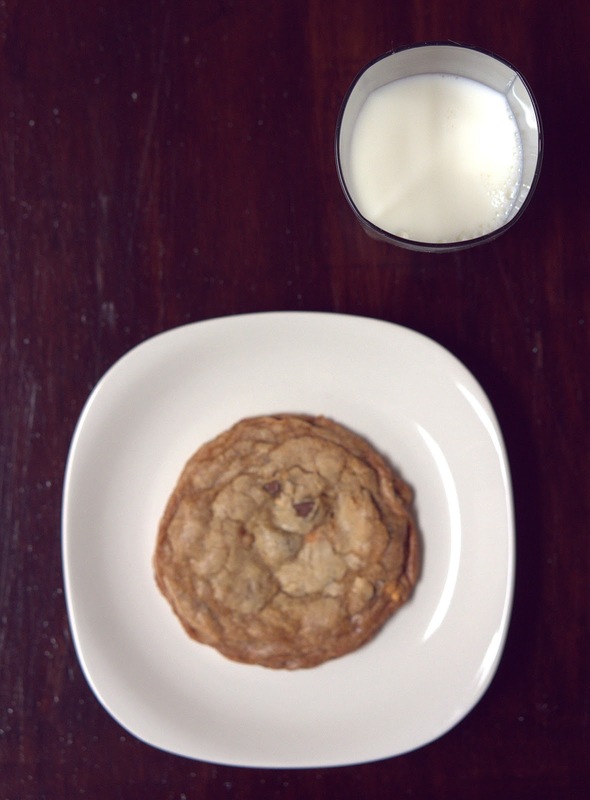 A large, crispy-on-the-outside-chewy-on-the-inside-cookie. Here is to a great Thanksgiving break, and back to the homework we didn't get to during the week. Wish me luck in school, it is going to be brutal. In a medium bowl, cream together the melted butter, brown sugar and white sugar until well blended. Beat in the vanilla, egg, and egg yolk until light and creamy. Mix in the sifted ingredients until just blended. Stir in the chocolate chips by hand using a wooden spoon. Drop cookie dough 1/4 cup at a time onto the prepared cookie sheets (don't be tempted to make them smaller, they aren't as good (texture is compromised) and trust, you will want them big). Cookies should be about 3 inches apart. Bake for 15 to 17 minutes in the preheated oven, or until the edges are lightly toasted. Sprinkle a pinch of sea salt or kosher salt on each cookie immediately after removing from oven. Cool on baking sheets for a few minutes before transferring to wire racks to cool completely. Don't you dare think about skipping the dash of salt. It is perfect.